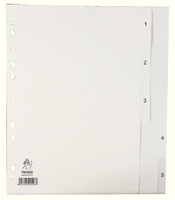 Set of 5 A4 dividers numerically tabbed (1-5). Ideal for sorting and organising papers. Punched to fit most standard A4 files. Made from clean and durable polypropylene. Ideal for well-organised filing. Index sheet for labelling and cross-referencing. Approx Dimensions (CM): D30 W22.5 H0.1. Approx Weight (KG):0.0311.